on trees. I still don’t like them. Besides, I don’t want to eat something that looks like it grows where the sun don’t shine. No wonder they don’t have eyes. 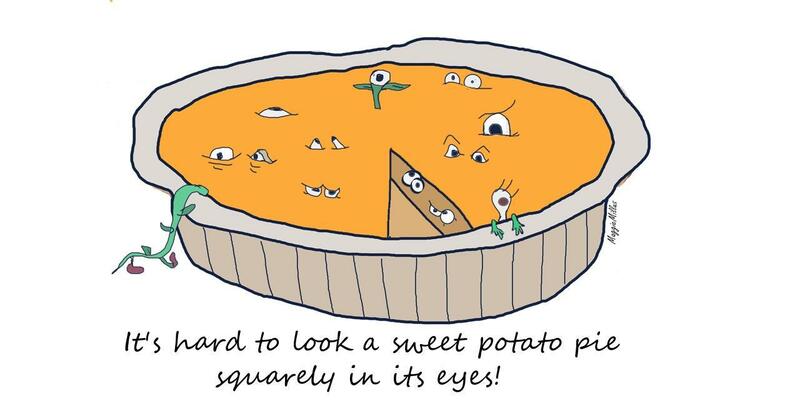 Now I will eat sweet potato pie. Why? Because it’s one of the six major food groups, that is, it’s a desert. (The other 5: beer, steak, pizza, ice cream, and potato chips). And besides, deserts are good – they have milk and eggs. I find sweet potato fries hard to swallow no matter how much grease is used. There is no in between. Too much grease and they move through your gut like lemmings stampeding toward the sea. Too dry and they form big wads and stick to your uvula. Dry potatoes never go down easy. It’s hard to swallow a golf ball. My mother would try to make me sit at the table until I cleaned my plate. She expected me to eat all the sweet potatoes on it, and rhubarb too. I hate sweet potatoes almost as much as I hate rhubarb. My dog won’t eat them either. I and the dog do not eat rhubarb and it’s a good thing, too. Rhubarb contains calcium oxalate, which is poisonous to dogs and cats and humans. Sweet potatoes can be long and skinny. Anything long and skinny always has bad connotations. The first thing I think of is disease. I bet sweet potatoes are really sickened white potatoes. Or white potatoes that have been left out in the sun too long. 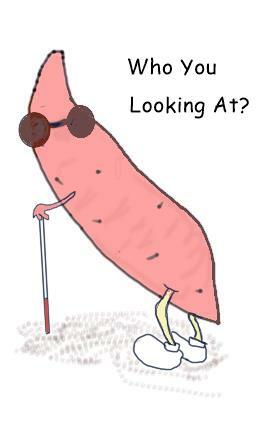 Sometimes sweet potatoes get discolored splotches, kind of like a sweet potato melanoma . I wonder if sweet potatoes get STDs? Sweet potatoes are not yams, They are spuds, tuberous roots. Unlike yams, they are tapered and less cylindrical and the internal color of a yam is lighter. Sweet potatoes are mistaken for yams, but they are not yams although both have similar outer brownish, orangish coloration. A sweet potato’s life span can be extended by colder temperatures. But they shrivel as they age. They get mushy and wet and then they leak water. They even smell bad. Who wants to eat an incontinent sweet potato! Sweet potatoes are rich in beta carotene. But overconsumption of beta carotene can cause human skin to turn a yellowish or orangish color. 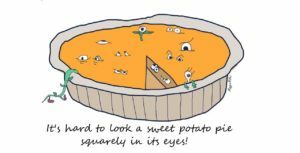 I have heard of people turning orange from consuming too much carotene , but never too many sweet potatoes. On the other hand, I don’t know what would happen if you ate too many of those purple sweet potatoes from Hawaii and Okinawa. It would probably discolor your tongue purple, like a chow or shar pei. (Worse yet, a giraffe.) I don’t want my skin or tongue to change colors, another reason not to eat sweet potatoes, especially purple ones.